Home is constructed out of very similar materials to the food gardens. Who designed the house’s plan and overall aesthetic? The shape of the house was determined by the site orientation, the previous damage on the land, and the existing bedrock. A Geotechnical engineer mapped out where we could build and then we transposed this to paper. We divided the house into two living spaces, one on the east, and one on the west. The East side had to include a one level suite for my parents, and the west side included the living space for Gord and I and the kids with our bedrooms upstairs. It was all very practical…Nature was the head architect, and we designed the space for Function and Beauty with the help of a friend (Cindy McCaugherty of http://www.raincoasthomes.com) who translated all our drawings into AutoCad for the Structural Engineer. Cindy helped a great deal with many of the details…both structural and the functional layout of the rooms. The layout of our living/dinning area was in all honesty inspired by a big slug that our daughter Emily (7 at the time) proudly showed off wrapped around her little hand in a beautiful “S” shape. I saw this and immediately made the connection and translated this shape into our home. I’ll never forget that moment as we had struggled for quite some time as to how to lay out the space to create the feel that we desired. As far as the overall aesthetic goes…we didn’t plan it…it just kind of evolved. The odd thing is that Gord and I never considered ourselves to be creative…we are actually kind of techie/ science nerds. Why did you decide to pursue the Living Building Challenge? We had already broken ground when the LBC was launched. When we heard of it we realized that we already had the same vision. Up until then we had felt kind all alone in our ideals, but then suddenly there was a name for our dream and a sense of belonging to a wider community that understood the same basic ideals. We had looked into the LEED program but there was nothing yet in Canada for homes. The LEED for homes pilot program was just getting going in the US and not yet in Canada. The LEED program also seemed too commercial and prescriptive for our approach. The beauty of the LBC is that it is not prescriptive in the petals or prerequisites. The visionary LBC program itself was actually more like an ecosystem, which from a systems perspective IS the only type of proven long term sustainable system. The Eco-Sense home and all of the systems were not fully designed before we started building…they evolved. System integration has become our specialty as we design with a whole systems approach which is very much in line with the LBC. Because we were mostly just the two of us and we had limited prior knowledge of how things were SUPPOSED to be done it enabled a creatively and systems thinking approach that was very original. Like I said earlier, nature was the architect, and we designed following this lead with a whole systems ecological approach without any preconceived ideas of how things were supposed to be done. Was it difficult to incorporate the challenge’s requirements into Eco-Sense’s design/building plan? Nope, it all made sense. We didn’t change very much. Your house achieved 4 of the 6 “petals” in the challenge–What could you have done differently to achieve the remaining two petals: energy and materials? Would you have done this if you’d been able to? We met the requirement for 12 of the 16 prerequisites. The energy petal was not possible for us at the time. Our family is net zero electricity selling excess to BC Hydro and we have 60 solar thermal hot water tubes for domestic hot water and in floor hydronic heating, but we still use propane for cooking and wood gassification for extra winter heating. To meet the challenge, combustion or fossil fuels are simply not permitted. We could have tripled our 2 kW solar PV array, and put in two electric cooking ranges. This also would have enabled the use of a heat pump powered by solar PV. For us at the time using a wood gassifier (smokeless, and 85% efficient) was a good local choice as we live on 8 acres surrounded by trees. However saying this we do agree with the requirements of the LBC for NO COMBUSTION. If we were to do it again, we now have the knowledge/ability to design from the ground up a much more efficient envelope with expanded solar thermal heating and possibly, very small heat pump back up. PR05 Materials RED List: YES! We successfully avoided the toxic materials red list (the toughest of all prerequisites). PR06 Construction Carbon Footprint: YES! Eco-Sense home has a ZERO carbon footprint…no carbon offset payment required. PR08 Materials service radius: NO! Scored perfect…except for the imported Bamboo. (better planning on our part…our focus at this time was to get our family into the house and not spend another winter in the trailer). Why did you choose cob construction? Beauty, local, affordable, fun to build, minimal carbon footprint, 500+ lifespan, healthy, no plastic in the walls, no mould, thermal mass, cool in the summer, very quiet, excellent acoustics, seismically engineered, healthy natural non toxic materials, temperature and humidity moderation, proven in our climate which is similar to the UK. etc…i could go on. Did you complete it by yourselves, or did you have some professionals helping out on some aspects? We had an electrician, a plumber, a structural engineer, and a friend to help with framing the roof and other jobs. We did a couple of cob building workshops, but these were more fun/ teaching events as we would actually get more done just the two of us. We have made life long friends from these workshops. Met some great people. It’s a beautiful house, and a fine example of truly sustainable living, although most people would consider it far from the mainstream. Why is this the right house for your family, as opposed to a more conventionally constructed sustainable home? The home fits our family and values…we simply love our home. 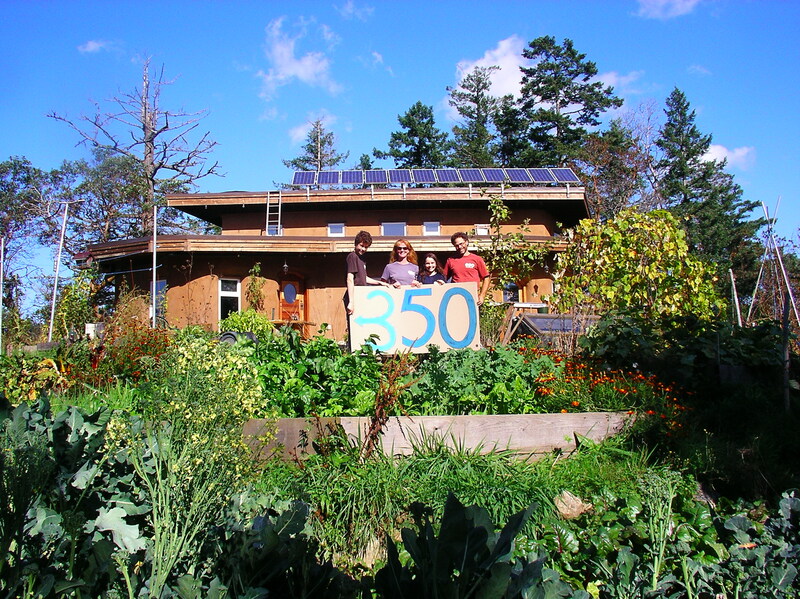 The home was also $148 per sqft including $80K in sustainable energy technologies and our own labour. Yes, this is not right for everyone. Our homes should reflect the inhabitants. DIVERSITY is essential in natural systems, in people, and in ecological design. A truly sustainable home is going to look very different depending on the occupants, the function, the climate, the site, and the creative preference of the occupants. We are all different and our homes should reflect this. Our homes should reflect who we are, our values, and not what industry tries to sell us or is the latest fashion. This entry was posted in Articles, Media Articles, Technical data and tagged living building, net zero energy, solar PV, solar thermal, sustainable building. Bookmark the permalink.